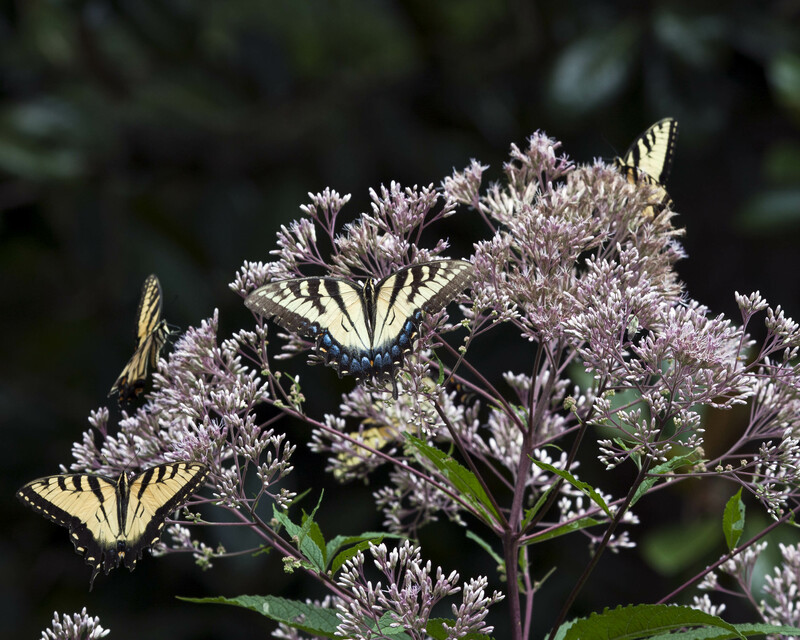 Swallowtail butterflies mobbing the Joe Pye Weed. Record amounts of rainfall this growing season continue to create ripple effects throughout my landscape and gardens. For the first time I can remember, I harvested two zucchinis today. Normally by this point in the summer, heat, drought, and insect pests have exterminated my squash crop. Not this year. Zucchini spice bread, anyone? Likewise, the Fortex pole beans seem to be ramping up for another surge in bean production. The vines have already climbed their six-foot trellis, grown down the other side, and now I’m trying to persuade them to climb back up again. Tomatoes? Oh yes, we’ve got tomatoes. The plants are fighting fungal diseases, but the fruits are coming in bigtime. Ornamental flowers, which have often surrendered to the heat by now, continue to bloom with abandon. I’ve got sunflowers, zinnias, nasturtiums, and cosmos among the annuals. Perennials like black-eyed Susans, coneflowers, salvias, verbenas, daylilies, and now cardinal flowers have never been happier. 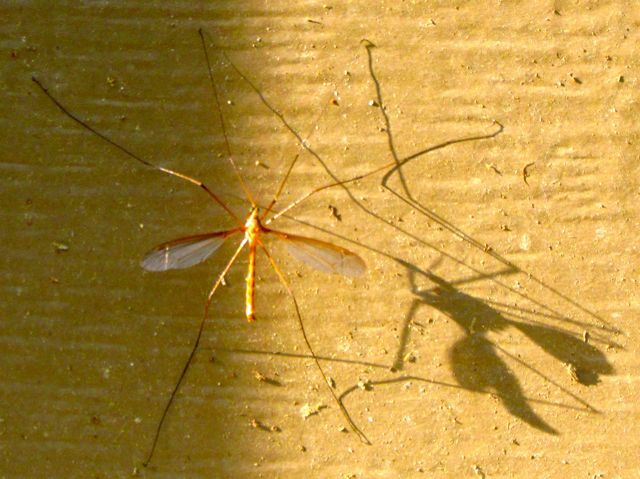 The rain has also produced a bumper crop of biting flies, gnats, and mosquitoes, among the aerial pests. But that’s not all bad, because the record abundance of flying insects has also brought record numbers of predators to prey on them. 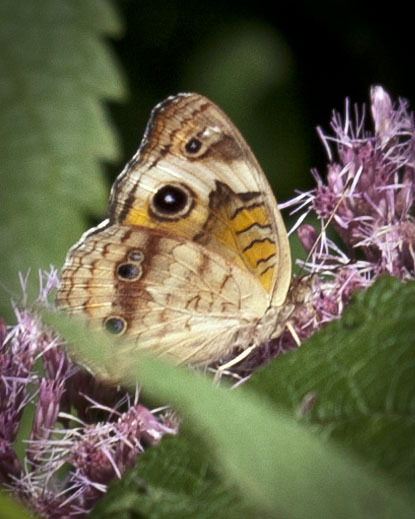 Insect eaters like Eastern Bluebirds, Blue-gray Gnatcatchers, Carolina Wrens, and Eastern Phoebes patrol the skies from dawn to dusk. Numerous bats take care of night patrol. And during the heat of the day, when the birds relax in the shade, the sky dragons take over. A Sky Dragon pauses briefly before resuming its hunt for flying food. 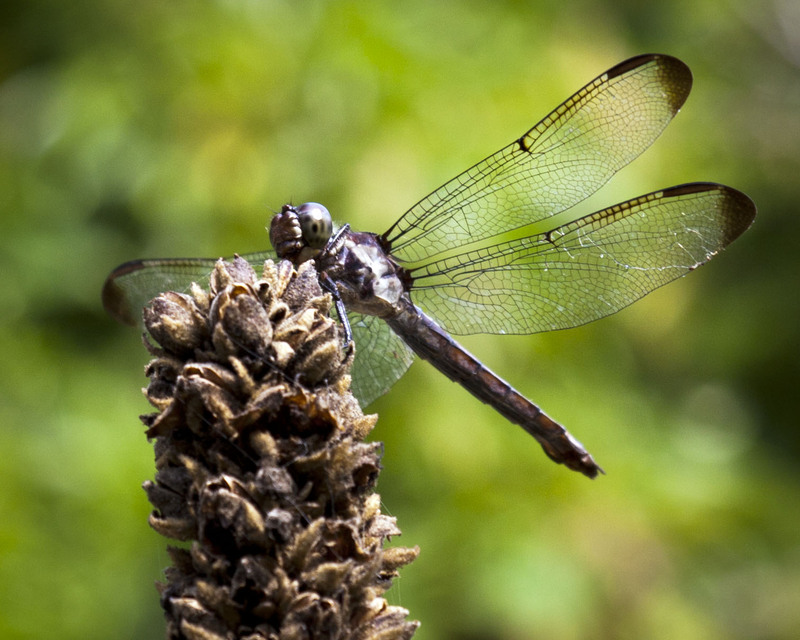 I have not yet spent the time needed to learn the names of our local dragonflies, but I can tell you our landscape is blessed by quite a number of species, some small, some as large as the hummingbirds with whom they share the sky. 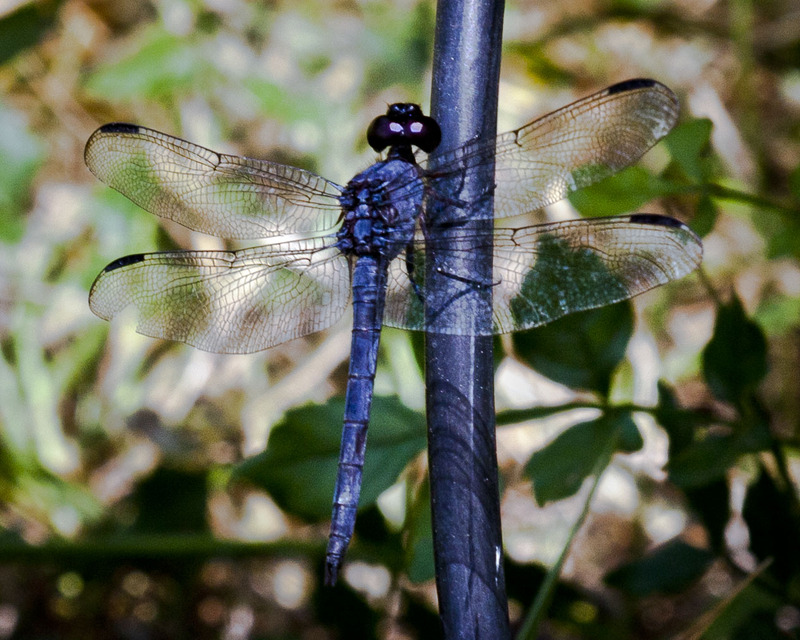 Wonder Spouse was so struck by the diversity of dragonflies in our yard last weekend that he spent some time capturing them with his camera. In fact, all the photos in this post were taken by Wonder Spouse. 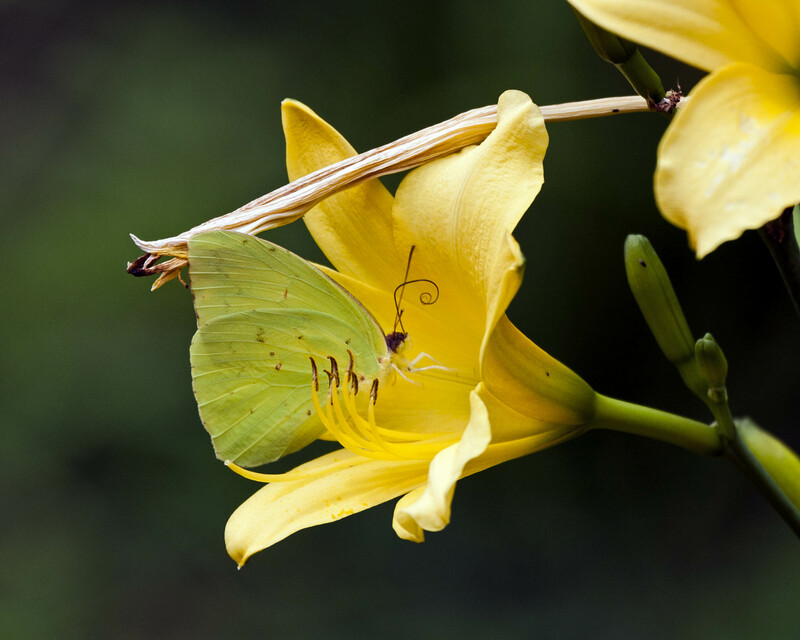 The butterflies thrust themselves deeply into the throats of the flowers of our Autumn Daffodil daylilies. See its tongue curling above its head? 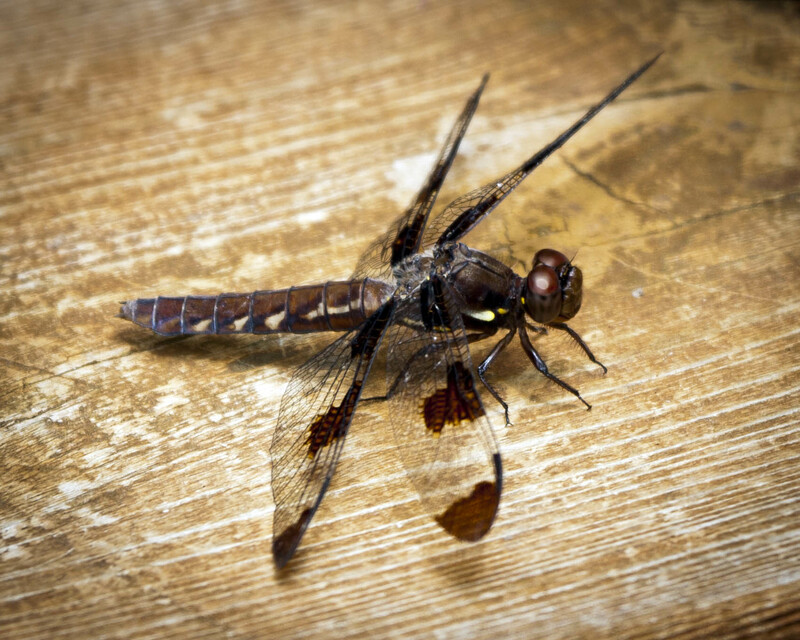 Dragonflies are efficient hunters, and yes, they do grab and devour an occasional butterfly on the wing. But they glitter like jewels; their wings appear to be made from delicate lace, yet are strong enough for aerial maneuvers any stunt pilot must envy. 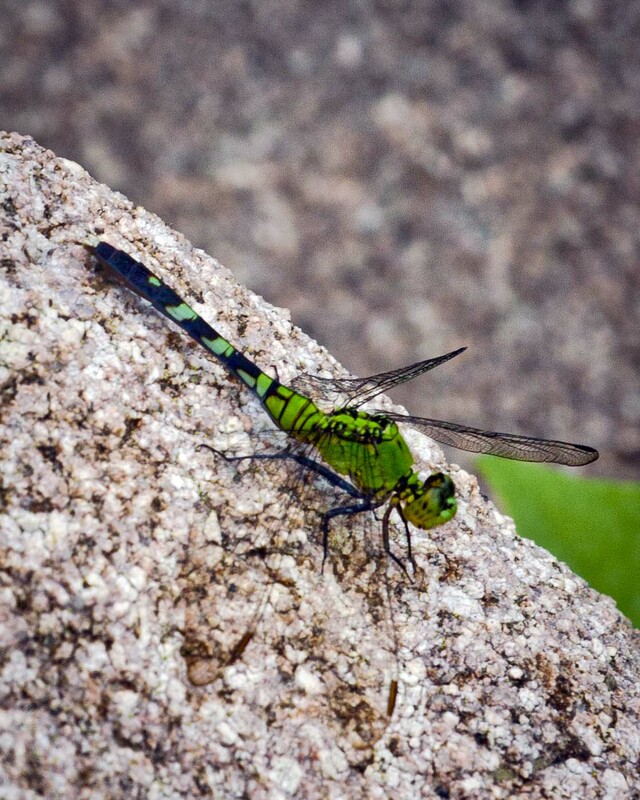 An emerald Sky Dragon pauses on a boulder. 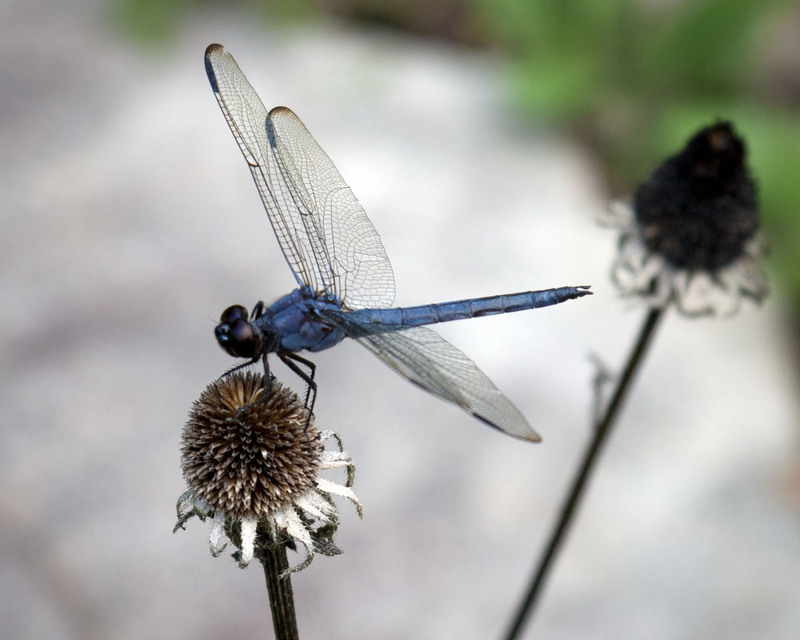 As much as I love the butterflies, this year we can lose a few to the dragonflies. My Chinese Abelia, a massive shrub about 10 feet tall and equally wide, has been blooming since June — and continues to do so. 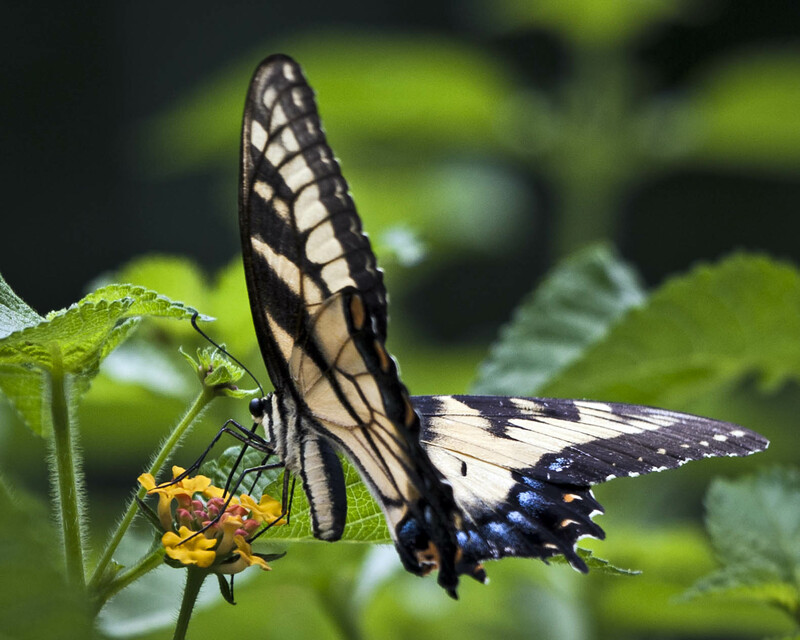 All day long, it is visited simultaneously by at least a hundred butterflies. I’ve never seen so many! 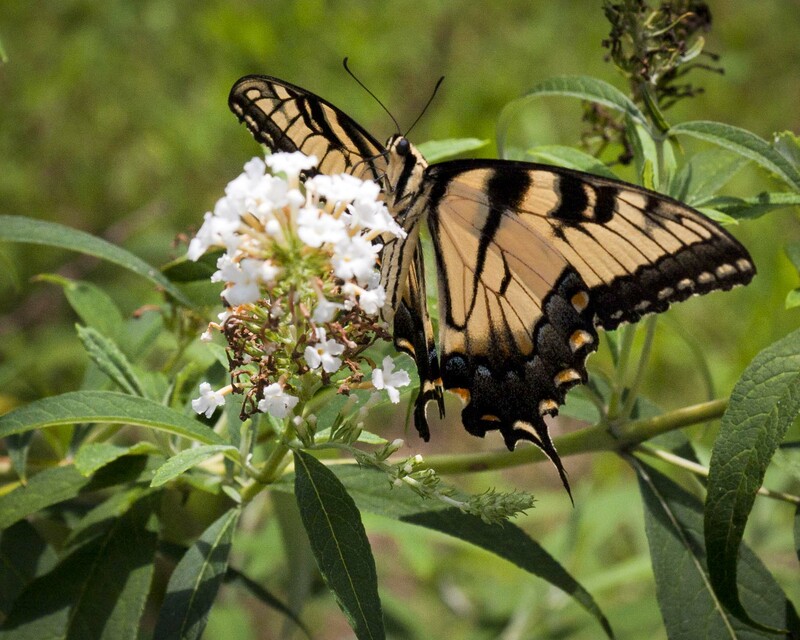 When they fill up on the Chinese Abelia, the Eastern Tiger Swallowtails stop by the lantana growing along the front walk. Between the drifting flight of butterflies and the zooming quick starts and stops of the dragonflies, I get bumped into on a regular basis as I walk around my yard. 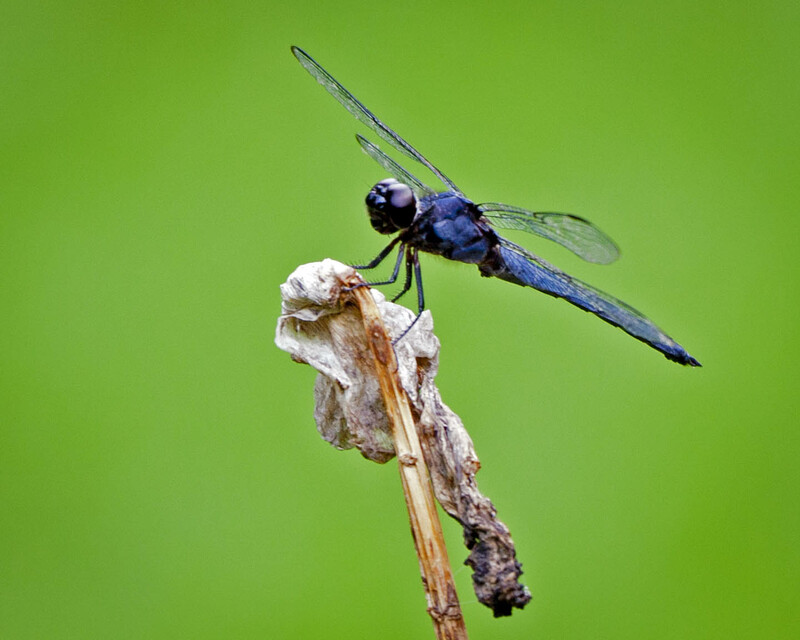 This dragonfly appears to be made of lapis lazuli, or perhaps sapphire. 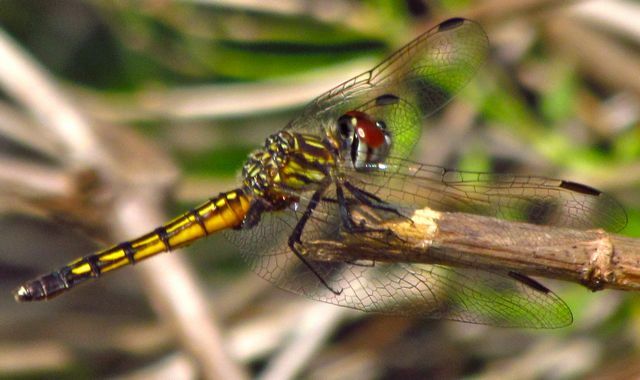 Patterns on the wings of the dragonflies are likely diagnostic. I really must learn the names of these hunters. The white wing bars on this one make it more noticeable in flight. This one appears to be designed to blend in with the trees. Butterflies, of course, are silent creatures. If I stand right next to the blooming abelia, I can sometimes hear a gentle fluttering of wings by the Spicebush Swallowtails, which never seem to remain motionless for more than a few seconds. 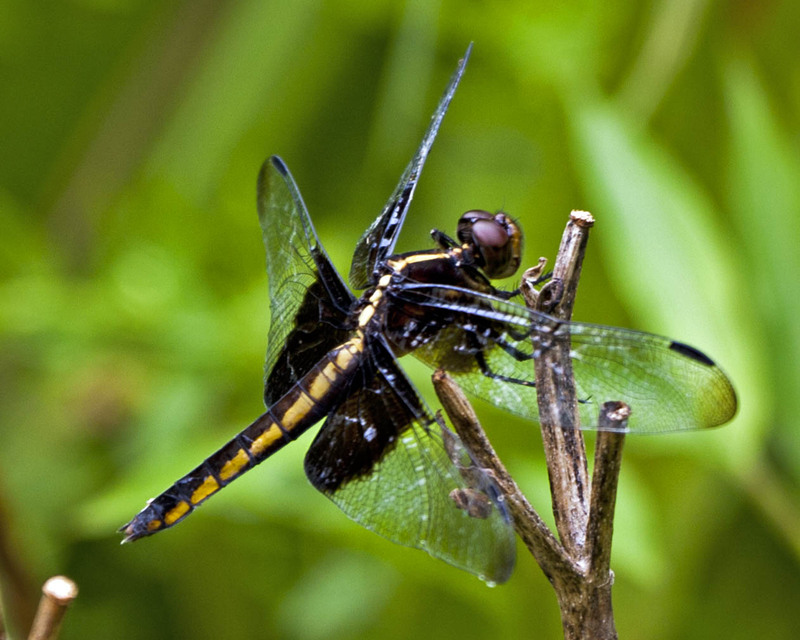 Dragonflies make a bit of a buzzing noise as they zip erratically through the air, snagging snacks on the wing. 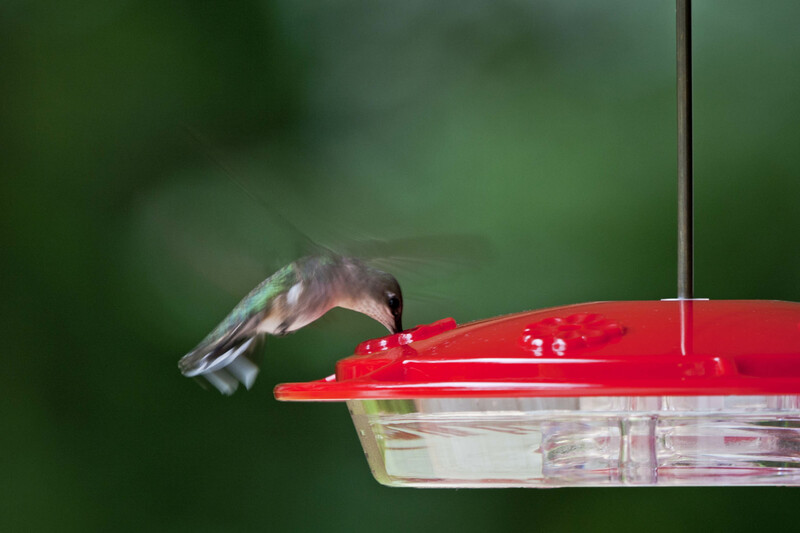 But for aerial maneuvers with sound effects, you can’t beat the Ruby-throated Hummingbirds. This season has brought a bumper crop of them to the front feeder. The bejeweled beauties visit it from dawn to full dark. It seems to be a pit stop for them when they tire of dashing from coral honeysuckle to cardinal flower to salvia to abelia, all the while chittering as they argue over the rights to a particularly tasty nectar source. After an early morning harvest session in the vegetable garden, I spend probably too much time sitting in the shade and watching the aerial show. I’m not the only one. 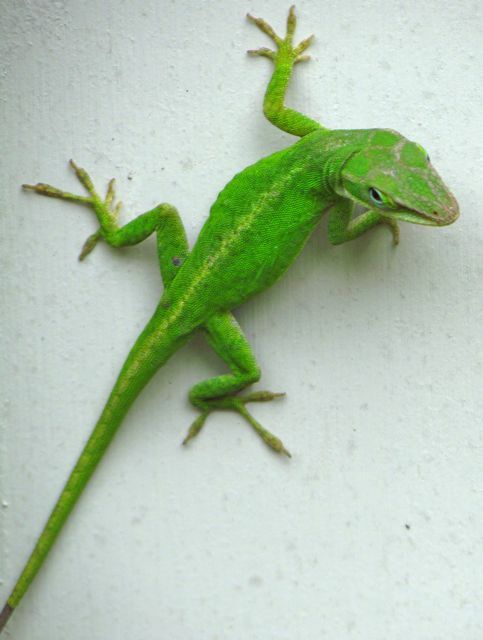 I often spy a Green Anole perched on a shrub or vine within grabbing distance of unwary butterflies. And a large Green Frog usually meditates in one of the pots of sedges and pitcher plants sitting in our front water feature. The cicadas thrum, the hummingbirds swoop and squeal; in the distance, a Yellow-billed Cuckoo calls from the treetops, predicting more rain. Pesky bugs and all, it’s the best summer we’ve had in years. I reckon I’m not going to feel to guilty for enjoying it as much as possible. A Sky Jewel grabs a quick drink from the feeder that I keep supplied with fresh fuel. 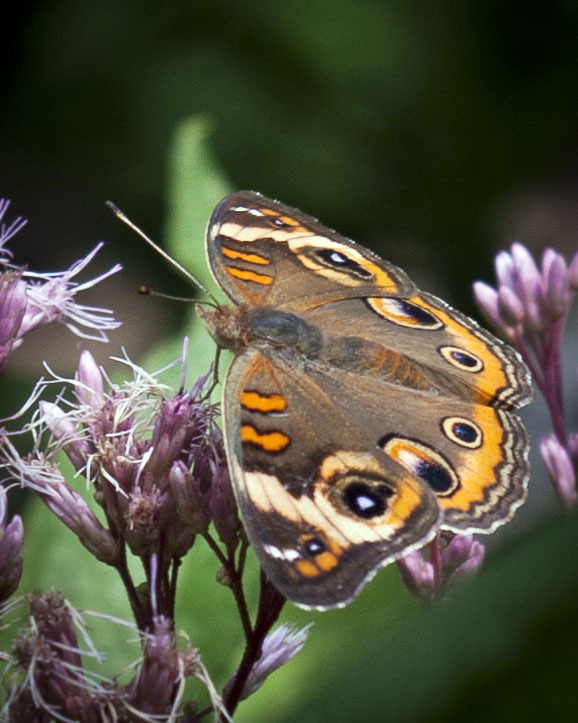 Common Buckeye enjoying Joe Pye Weed. My five-acre patch of Piedmont is positively bustling with animal life these days. Perhaps the creatures have noticed the sun’s later risings and settings, and have begun their preparations for winter. Whatever their reasons, every day we seem to stumble upon an interesting resident or visitor. 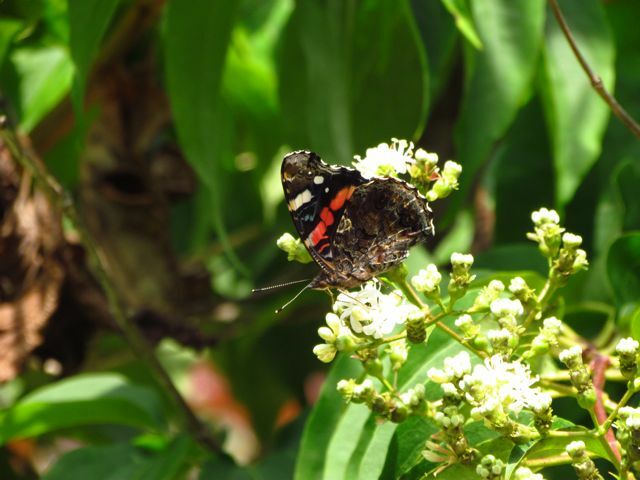 Red Admiral enjoying Seven-Sons Flower Tree blooms. The Seven-Sons Flower Tree blooms attract pollinators of all kinds. See how the end of her(?) tail is brown? I wonder if she injured it. Big Bertha has claimed a prime location, where many unsuspecting pollinators become her victims. Check out the head on this predator. 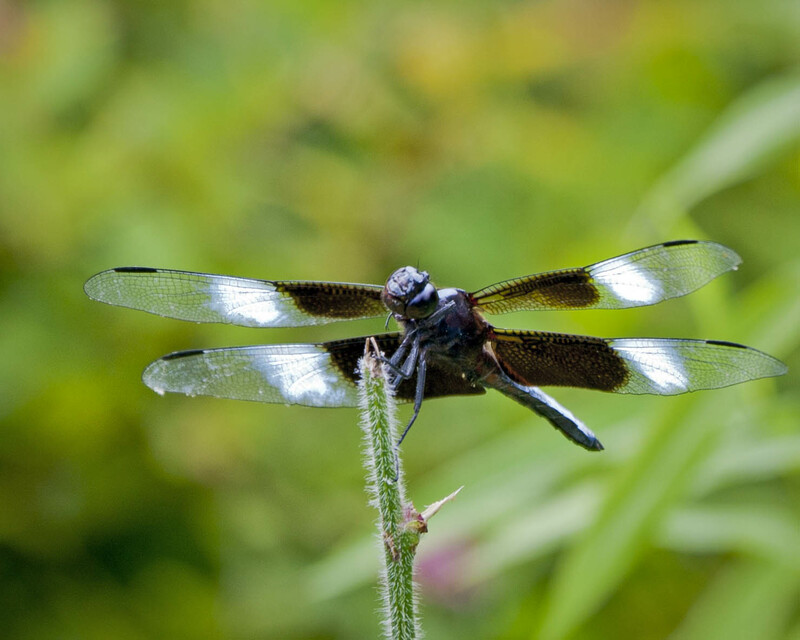 Dragonflies are more cooperative models than butterflies, which tend to flutter from flower to flower too frequently for optimal photo ops. The creepiest photo Wonder Spouse took that day was this fly. I don’t know its species, but I do know it is big, mean, and aggressive. 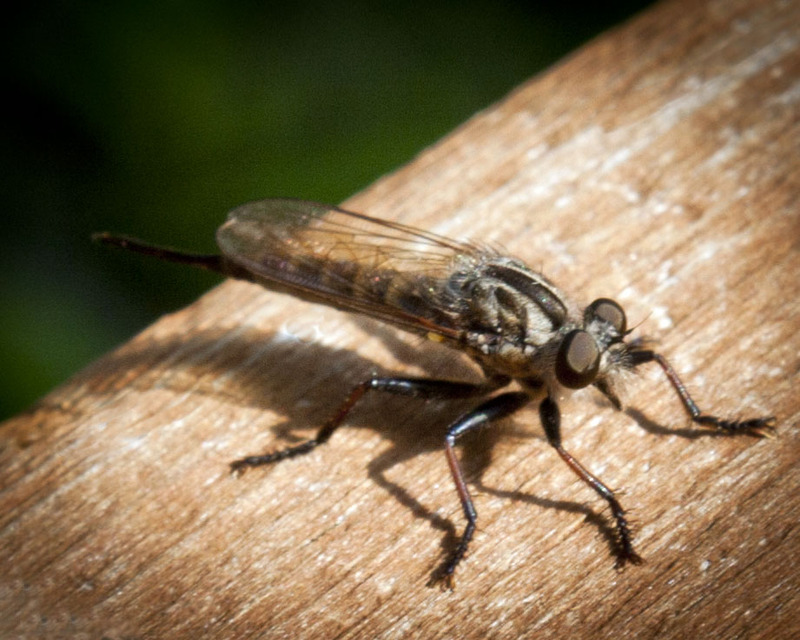 This fly and its kin are the reason we do not wear shorts in our yard. The bites of these monsters hurt for weeks. I’m sure it has a place in the ecosystem, but its kin are not my friends. They were walking in the mowed area at the far end of the floodplain, strutting about in the rain, one often chasing the other. Once we got the birding scope on them, we were able to confirm these were indeed Wild Turkeys. Over the years, we’ve seen a few not far from here, but never in our yard. As we watched, they gradually wandered closer to us, but never closer than the large Red Buckeye that grows near the creek. In fact, when the rain grew heavier, they both huddled beneath the thick canopy provided by that Red Buckeye. We could just make out their dark shapes through the driving rain. 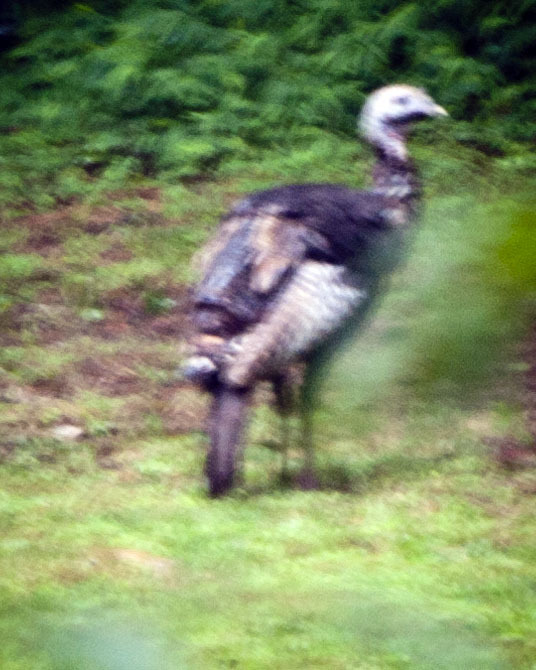 When the rain let up, the Turkeys wandered back out into the grassy area, so Wonder Spouse grabbed his tripod and set up his camera — with telephoto lens — in front of the sliding glass door overlooking the floodplain. It was still raining too hard to take the camera outdoors, the light was dim, and the Turkeys never stayed in one place long enough for a decent shot. 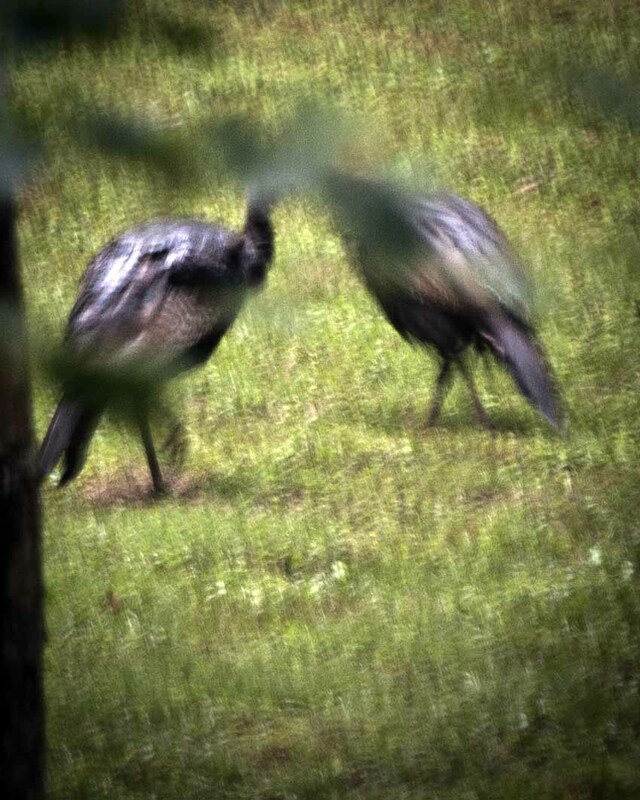 But these photos at least confirm a visit from two Wild Turkeys — females, we think. The only shot of both birds together. Yup, it’s really a Wild Turkey. Despite the off-and-on hard rain, the Turkeys wandered around the floodplain for about 45 minutes, until something caused them to dash out of sight for good. We thought we were done with visitors for the day, until we spotted what had caused the Turkeys to flee: a large Common Snapping Turtle! We don’t think she was after the Turkeys, but we don’t blame them for erring on the side of caution when dealing with this species of reptile. 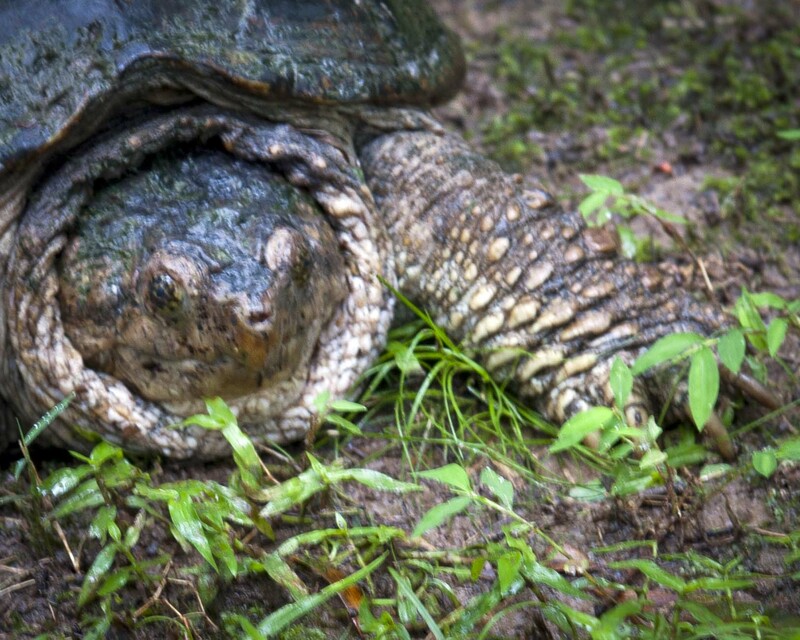 When the rain paused for a bit, Wonder Spouse and I went out for a closer look at the Snapper slowly lumbering across the floodplain. We see Snappers and River Cooters every once in a while; they are always females in search of the soft sandbars they prefer for nesting sites. Wonder Spouse was able to get a few close shots of what we think is an old female during a pause in the rain. We are guessing she is old because of the significant wear evident on her shell; the characteristic ridges seem to have been eroded. She froze in mid-step when Wonder Spouse stepped, respectfully, in front of her for a head shot. She looks almost as if she were carved from local stone, or perhaps a cypress knee. We didn’t bother her for long. 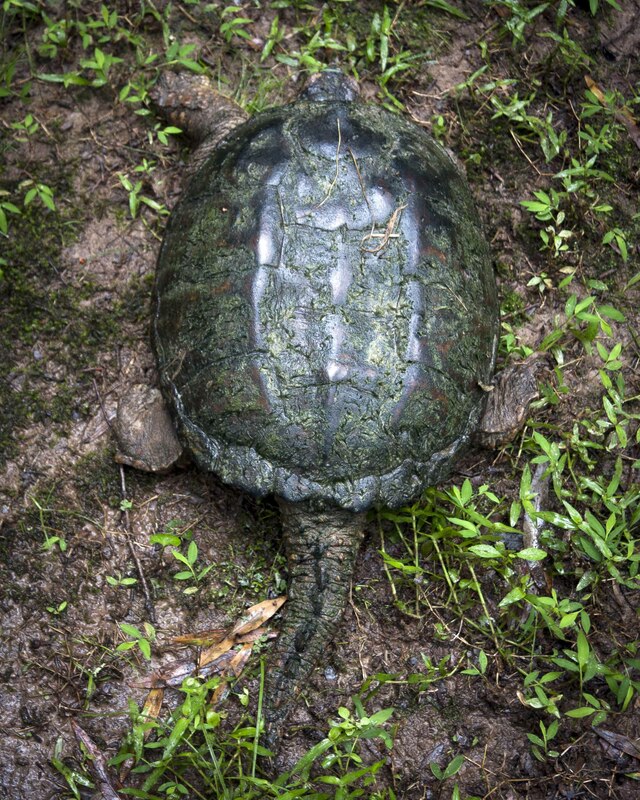 A quick online search revealed that these turtles often come out to lay eggs in weather like today’s, probably because the ground is softer, I imagine. We have a healthy respect for the Snapping Turtles that share our property. We leave them to their business, and they don’t bite off our toes or fingers. Seems a fair deal to me. I’ll be keeping watch for another visit by the Wild Turkeys. We found a Web site that included recordings of their various calls. When I listened to them, I realized I’ve been hearing these calls all summer. I think Wild Turkeys probably nested in the floodplain woodland across the creek from our property. I had been hearing bird calls I couldn’t identify, and had decided they must be a neighbors’ poultry. But now I realize that the Wild Turkeys have been talking in the adjacent woods all summer. What a great day this has turned out to be. 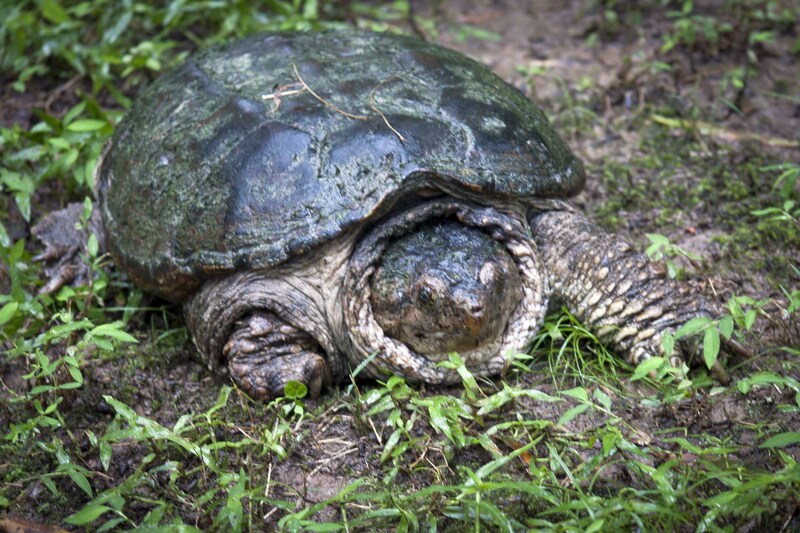 Not only did the plants get a much-appreciated dose of moisture, but the Snapping Turtles got a chance to multiply themselves, and a new bird species stopped by — in the pouring rain! I count myself lucky to be gardening in the Piedmont region of North Carolina this year. Sure, it’s still hot, but the unrelenting 100+-degree temperatures have backed down to the unrelenting low 90s. And although most of the good thunderstorm rains are still bypassing my yard, the air is soupy, sticky with humidity. The dregs of summer are here. Signs are clear in the vegetable garden too. All tomato varieties are losing lower leaves to climbing fungal attacks, yet still their tops soldier on, producing enough ripe fruits to share with friends. The peppers are ripening well, but fruit worms are boring into the nearly ripe fruits, ruining some completely, rendering others only partly edible. Such are the usual late summer consequences of gardening without toxic chemical weapons of mass destruction. Although the few rain showers that deigned to stop at my house have not brought enough water to help my stagnant creek and pond, the drops that fell were sufficient to revive the flowers. The giant Chinese Abelia that resides beside my vegetable garden had almost stopped blooming — much earlier than in previous years. 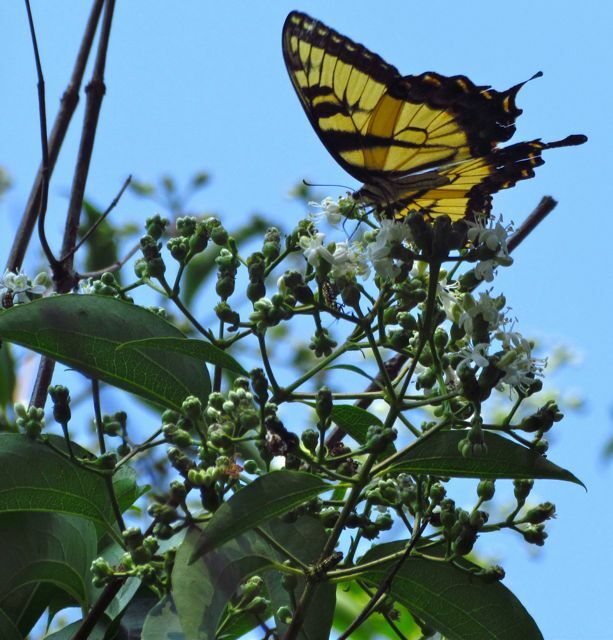 But the recent rains persuaded it to reopen for business; now clouds of swallowtails, other butterflies, day-flying sphinx moths, and myriad bees animate the bush with drifting flows of color from dawn to dusk. The Seven-Son Flower Tree is equally popular with the pollinators. Heavy perfume from these small flowers hangs in sticky morning air, an invisible entity waiting to envelop unsuspecting passersby with fragrance. Seven-Son Flower Tree blooms are also current favorites of the pollinators. 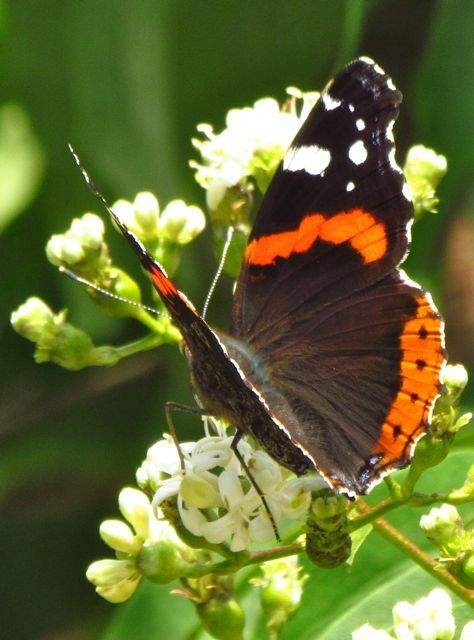 Without question, butterfly and dragonfly populations are at all-time seasonal highs in my yard. The butterflies literally bump into me as I walk from my front door to the garden, so intent are they on finding the next tasty blossom. 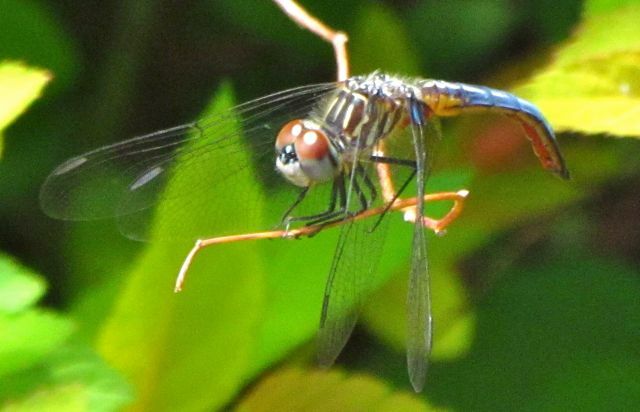 Dragonflies in metallic shades of blue, green, amber, and red zip through the skies, grabbing insects on the fly. When I try to photograph them, they seem to grow interested in me, following me short distances before returning to sky patrol. Wonder Spouse was out in the yard yesterday trying to photograph a few of the sky dragons. Check out these shots. 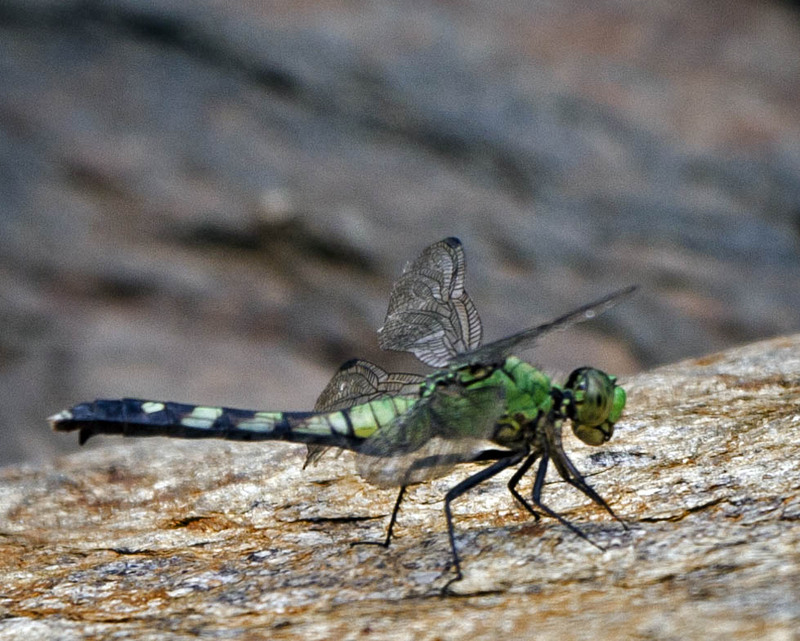 My dragonfly identification skills are nonexistent, but I know gorgeous when I see it. This one appears to be made from emeralds. 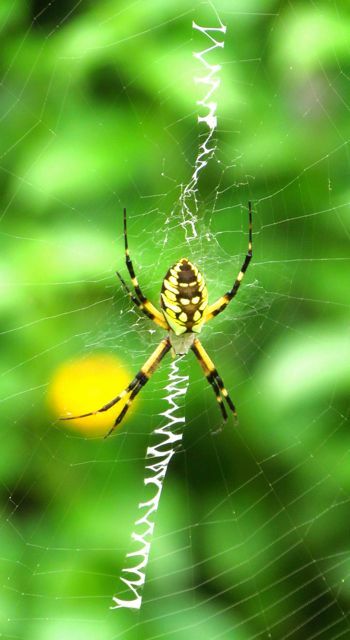 A final sign of summer’s waning is the arrival — in abundance — of Writing Spiders. 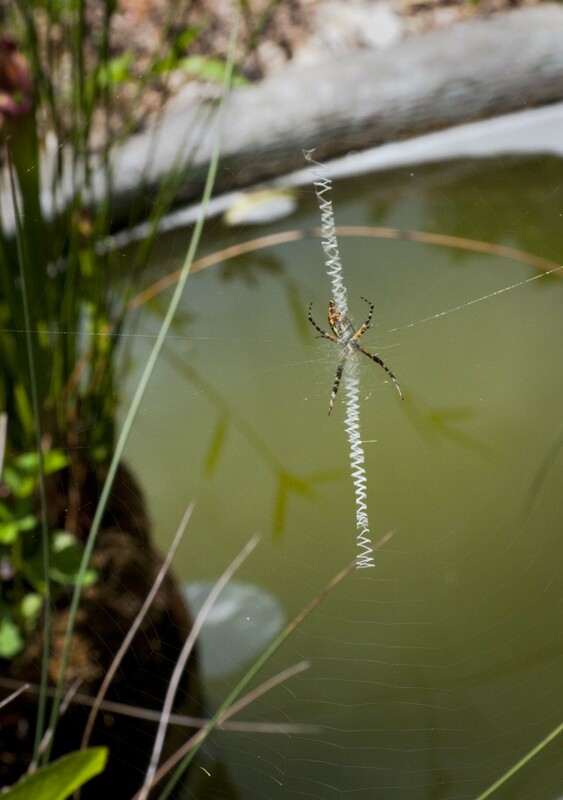 Last year, I showed you the large Black and Yellow Garden Spider that set up shop among the plants I grow in pots that sit within my front yard water feature. This year, instead of one large spider residing over this space, seven smaller Writing Spiders have overtaken this area. Perhaps they are the offspring of last year’s large spider, or perhaps word leaked out into the spider community that this locale was ideal for their purposes. However they came to find this spot, it is quite wonderful to see seven webs strung between sedge leaves and cardinal flower stalks, the characteristic spider writing prominent in their centers, along with seven growing black and yellow weavers waiting for unwary prey to stumble into their sticky traps. She waits patiently for dinner. Here’s to the waning of summer stickiness, the rise of sky dragons and butterflies, and the hope that the perfume of late-blooming blossoms will soon summon autumn’s kiss. Few people probably love the native plants of the southeastern Piedmont more than I do, but as much as I enjoy their nearly infinite diversity and adaptability, I think I would have long grown bored with them without being able to observe their interactions and interdependencies with native wildlife. 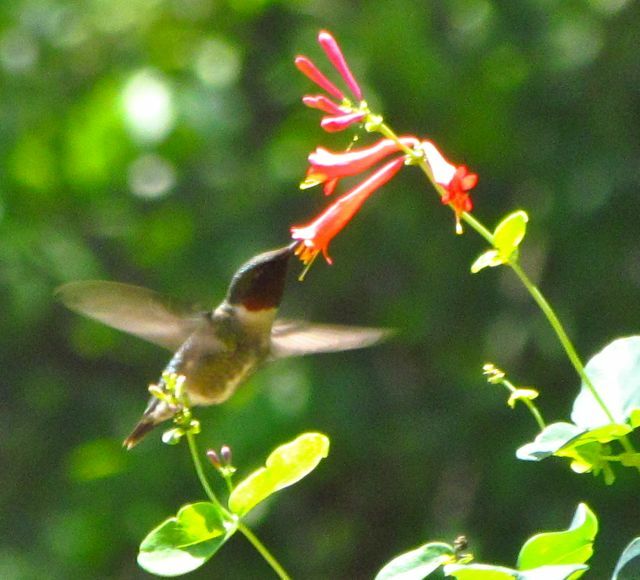 For example, the native coral honeysuckle (Lonicera sempervirens ‘Major Wheeler’) is beautiful on its own, but that corner of my landscape truly lights up when the Ruby-throated Hummingbirds stop by for drinks. From birds to insects to reptiles, amphibians, and mammals — all the wildlife inhabitants and visitors animate what would otherwise be a basically static landscape — no matter how much the trees and flowers sway in winds and rain. The animals generate many of the most interesting stories in my landscape as they go about their daily lives. On an early morning trip to my compost pile, I discovered that my laziness in failing to cover a recent donation had attracted an unexpected visitor. A Spicebush Swallowtail was dining on a bit of beet leaf. 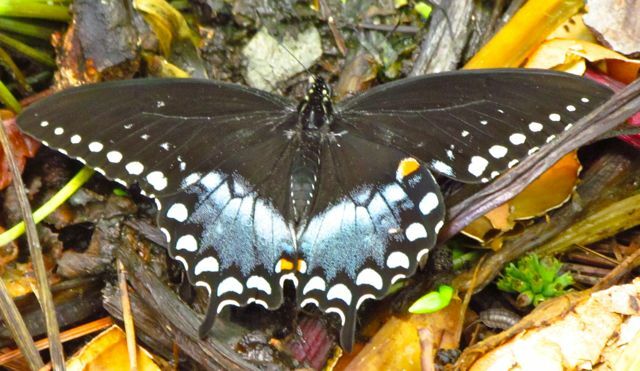 I knew that Eastern Tiger Swallowtails like to collect at mud puddles to drink up trace elements they don’t get from nectar, and I knew that Red-spotted Purple Butterflies were notorious for their appreciation of unsavory items. 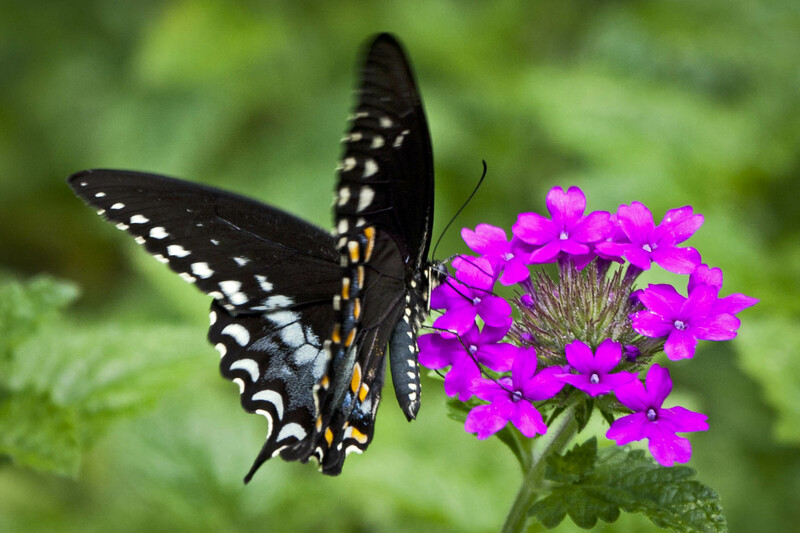 But I have never seen a Spicebush Swallowtail dine on anything but flowers. The treefrogs and the Eastern Narrowmouth Toads have been singing lustily around our little pond for over a month now. At first, it was just the toads chorusing, then the treefrogs joined them for a couple of weeks. Now, the nightly serenade sounds to be all treefrog all the time. 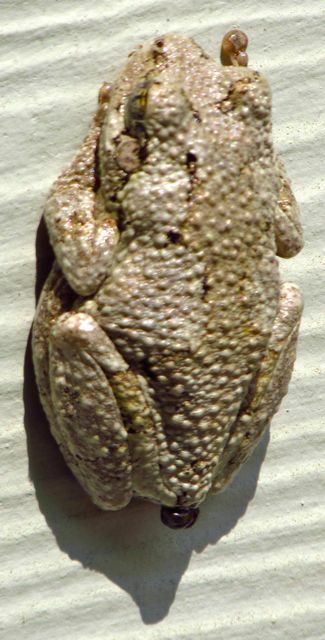 The calls of both amphibians are quite distinctive. I had never seen a Narrowmouth Toad until this year when I was digging a vegetable bed about six weeks ago. I accidentally unearthed two of them, and I wasn’t sure what they were until I did a little research. Then I was glad I had been wearing my gloves when I handled them, because their slimy skin secretions are toxic, designed to repel the ants that they eat. Given the enormous number of ant species that live in my yard, I say bring on the Narrowmouth Toads! These amphibians have been doing more than singing around my pond. 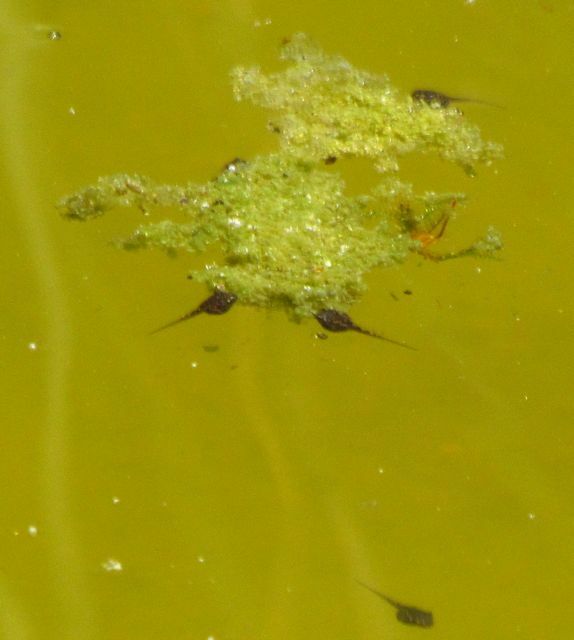 It is now teeming with tadpoles. I can’t tell if they are all toad tadpoles, or if the treefrog tads are in there too. In this shot, I think toad tadpoles may be dining on a treefrog egg mass, but I’m not certain. The water isn’t as green as it looks here, I promise. But it is definitely not as clear as it was during pre-tadpole days. My final picture today is not of the landscape animators themselves, but of their nest. About a week ago as I walked to the compost pile, a bird flew past me in a blur, seeming to want to distract me. I assumed I had merely startled it — I often unintentionally surprise wildlife — and continued. But as I approached one of our huge mature dogwoods, another bird flew past me. It seemed to come right from the tree, so I turned and looked. The dogwood is double-boled, with the split beginning not more than two or so feet from the ground. In that low crotch, I discovered a distinctive nest — Ovenbirds! We’ve spotted these ground-nesters often during the growing season, but we had intentionally never looked for a nest. I have never read of these birds building in a tree, but this wasn’t far off the ground, and perhaps it looked a tad more secure to them. 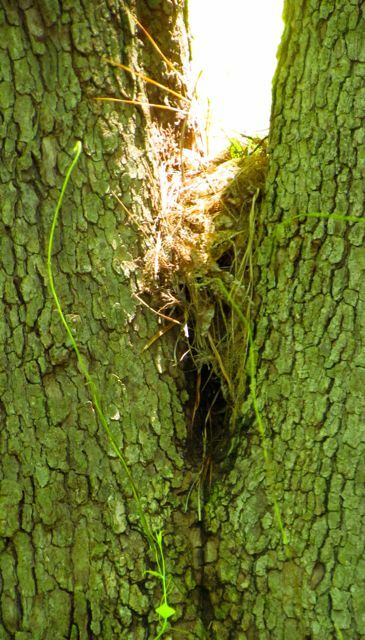 My yard is inhabited by many black rat snakes, so I can well imagine that a tree might look like a safer bet to the Ovenbirds. They’re called Ovenbirds, because their nests resemble Dutch ovens, with little holes where the birds go in and out. I think you can make out the structure in this photo that I took some distance away from the nest, so as to minimize their disturbance. I think the entry hole is near the bottom, but it’s hard to be sure. Alas, less than a week later, I discovered that the nest had been torn apart. Whether it was the work of a snake, raccoon, possum, or greedy squirrel, I’ll never know, but the nest is gone, and I haven’t seen or heard the Ovenbirds since. That’s the way of life with my landscape animators. Sometimes Death wins, but Life triumphs more often. And the dances between them are always captivating.